Decided to make a news post this time since last time people missed it in the GA thread. It's basically a batch file maker to compile maps without having to type anything. First, specify the tool's filename in the Folder Setup dialog. In the main dialog, you can check the box "SKIP" next to the QBSP checkbox. The skip tool will run right after QBSP. Once your map has been compiled and generated a .pts file, you can choose File->Pointfile (Ctrl+P). This copies the newly generated .pts file back to the source folder so you can load it up in your editor. You know, Quake is totally lacking in a decent and easy setup guide to use GTKRadiant or NetRadiant for mapping Quake. If someone could point me to the right answer, I've been eager to make an easy to setup package for NetRadiant. As much as I like Worldcraft, I accept the fact that because Worldcraft isn't open source it is going to rust, decay and break with time. 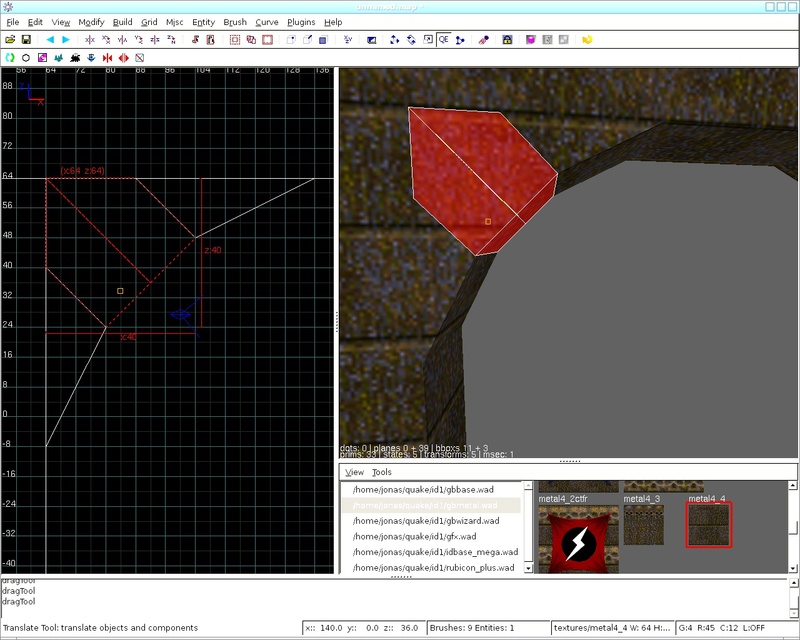 And all those beautiful Q3 maps are made in GTKRadiant, so it has to be a capable editor. Except I can't seem to set it up. http://kneedeepinthedoomed.files.wordpress.com/2010/08/curves11.jpg is a waste of brushes btw. You could do with one less. Make the two outer ones end in the edge and then use one "cake slice" for the middle one. Lawl. Name and shame. That's horrible. Also, doing it properly would generate a lot less than 1 extra face (which is more important than brush count) since the Q1 compilers are horrible for that (afaik, and as compared to the D3 bsp compiler). sorry to derail the thread necros :P for what it's worth i've been using this tool for a while now & recommend it wholeheartedly! I'll try your tool tomorrow necros, I need to install some .NET framework update first it seems. there's no reason to teach a sub-optimal technique unless it's easier to use... it's the things we learn first that stick with us the longest. I carve all of my maps out of one large solid brush, for example. In other words: I can't even start it up. this requires the vb .net runtimes (it's a vb app). * What about a huge "COMPILE" button on all forms of the GUI so you don't have to go File=>Compile via the menu? And I have a general question on the point files (lin vs pts) which is not directly related to your tool though. How do you tell the VIS tool which pointfile format you want? I guess there is a command line parameter but I couldn't find any info on that. if anything crashes, it was not directly caused by my gui. what my gui really does is just create a batch file when you compile and then it runs the batch file. it IS possible that something in the generated batch file is causing the crash however. ie: "C:\Quake\Compilers\vis.exe" instead of just "vis.exe". it's possible that may be causing the problem... but that's just a wild guess. if you can tell me where to get the specific tyrann vis, i'll take a look at it. Could have had the shortcut idea myself I guess. ;)(but I wrote this some days after I tried it and at work where I didn't have the tool). Peg told me about exactly the compile tools you mentioned today, thanks for the link. And on the point files: Ah k, I thought they were in different format but it's just the extension. Thanks for the clarification. a question; are they supposed to be copied with the bsp to the output folder? my output folder was the same as my working folder until recently, but i've changed and noticed only the bsp gets copied across now..
no, the pts files do not get copied automatically from work -> output. in fact, pts files should never appear in output. source folder: where you work and save your map. pts file ends up here when you press CTRL+P. output folder: the only thing that goes here is the .bsp file. i didn't know anyone used the builtin pointfile thing anymore, i figured everyone used editor pointfile loading. the link to this on your site appears to be dead. i would plug my old harddrive in and copy the file over to my new(ish) PC but, you know, i'm pretty lazy. Thanks for reminding me. I've been slowly moving my stuff back to wordpress but the links haven't been updated. I'll have to point to quaddicted mirrors (probably the only sources for now at least) until I can get my own hosting going.